Your car's transmission goes out, your manufacturer's warranty expired six months ago, and your mechanic informs you it will cost $4,000 to replace, not including labor costs. For a fraction of that cost, you could have purchased an extended auto warranty when the original warranty expired that would pay for the necessary repair. 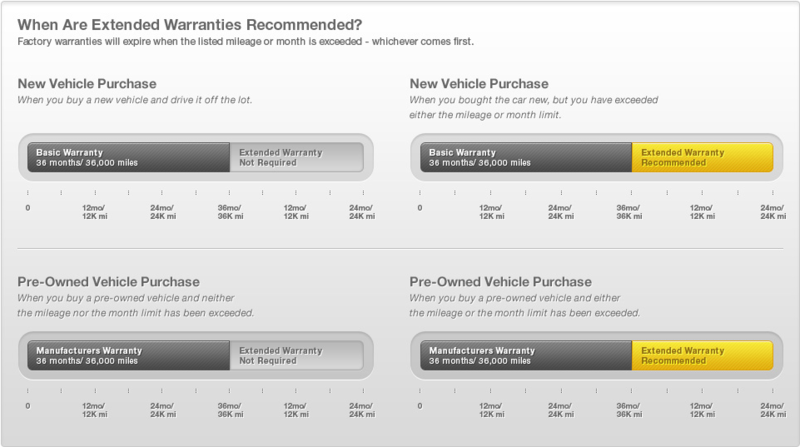 Read on for help deciding whether an auto extended warranty makes sense for you. Also known as a used car warranty, an extended auto warranty offers similar protection to that of the manufacturer's warranty once the original warranty has expired. Used car warranties are sold and managed by independent companies rather than manufacturers. As with a new car warranty, an extended warranty covers repairs for breakdowns, malfunctions, etc. but does apply to routine maintenance. Typically, the price of car warranty insurance is set according to the make, model, year, and mileage of the covered vehicle. The newer a vehicle is, the less extended warranty car plans will cost. With most plans, you will also have to pay a deductible when you make a warranty claim. Each extended auto warranty is different, so it's best to check with your warranty company about what is and is not covered. Generally, extended warranties for cars are exclusionary, meaning it's easier for the company to list what is not covered than what is. Almost all repairs related to breakdowns are covered by auto extended warranties as well as the cost of labor and sales tax in most cases. With some plans, your rental car expenses may also be covered under warranty if you have to rent a vehicle while yours is repaired. Regular maintenance related to wear-and-tear issues typically is not covered. A used car warranty isn't the right choice for all used-car drivers, but it makes a lot of financial sense for those who meet certain criteria. Of course, you should drive a vehicle for which the manufacturer's original warranty has expired or soon will. Additionally, to get the most value from an extended auto warranty, you should intend to keep your car for a fairly long time. If you plan to trade your vehicle in or sell it in the next year or two, an extended car warranty won't be of much use to you. In deciding whether to purchase extended auto warranties, also consider the cost of repairs for your particular vehicle. Certain cars are inordinately expensive to repair, and if you could not pay for unexpected repairs out of pocket, the protection of an extended warranty makes financial sense.